A Moment in Connemara is a love story set between the United States and Ireland. The book, written by Annie Quinn is the love story of the author and her second husband Noel Quinn. The book was inspired by her journal writings and her decision to write the story for Noel’s family so they would know more about him and his life between Ireland and the States. A Moment in Connemara was our book club choice for April and we had the fun event last night. The book was chosen after one of our bookies met the daughter of the author and found out her mother had written the book. Annie Quinn is a delightful woman and she joined us for book club last night highlighting her life with Noel. Okay, I’m going to spoil a little of the book for you. I try not to do that, but in this case I am going to break protocol for just a minute. Annie met Noel after her marriage to her high school sweetheart ended in divorce. Annie is now adjusting to life as a single woman. She takes a trip with a few girlfriends to Ireland, and while on tour, their group stops at a hotel for the night. The girls head down to the pub in the evening, where she spots Noel sitting alone in a corner of the pub, they meet, talk music and thinking nothing more of the encounter, Annie doesn’t know it but her life is about to change. 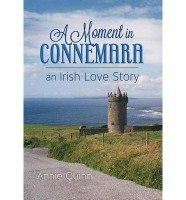 A Moment in Connemara follows the lives of Annie and Noel, through a chance encounter to meeting each others families and Annie’s children. Their journey is one of those just meant to be moments. A life filled with joy beyond belief, illness and the differences in cultures. Just when you think you may never marry again or meet that someone who melts your heart, A Moment in Connemara will restore your hope. The book reads as though you are sitting over a cup of tea or coffee with the author and she is simply sharing her story. It is an easy read and a lovely story of hope, happiness and meeting the person you are menat to travel life’s path with. The descriptions of Ireland are vibrant and beautiful, for those of you that love to travel, you will want to go after reading the book. Book Club was so much fun and having Annie with us was a special treat. We heard additional stories and her beautiful daughter joined us too. She talked about the book and how nice it was to read the story that she lived, but seeing it through her mother’s eyes, thoughts and feelings was pure joy and gave her a different perspective. We enjoyed a mixture of scones with lemon curd, Irish Soda bread and butter, Irish cookies, Irish cheeses and crackers, of course wine and it wouldn’t be complete without a cold Guinness and our Irish Shamrock socks warming our feet on a cool evening. I will see you back here in a week or so. I am reading Safari by Geoffrey Kent and now I am ready to book a safari. Our May book is A Man Called Ove by Fredrik Backman. We will have a lot to chat about.